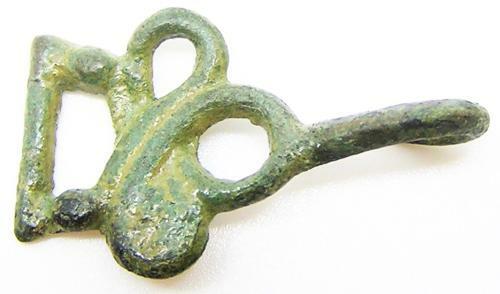 This is a nice Tudor period clothing hook, dating to the 16th century A.D. It is in the form of a bow, of the type used as a 'Lovers Knot'. The hook is intact with a sharp pin. This hook would have been sewn onto clothing, used to secure rich embroidered fabrics on gowns and doublets. DATE: c. 16th century A.D.